When it comes to automotive tools, Snap-On is one of the most well known and renowned names around. They are known across the globe for their extremely high quality products, outstanding warranties, and ubiquitous presence in tons of speed shops, independent mechanics, and car dealerships alike. Lesser known, but equally as awesome, is the Snap-On industrial brand CDI that manufactures torque wrenches and related products. CDI has existed since 1968 and now falls under the Snap-On umbrella which means that they are associated with the same high quality as Snap-On. Although lesser known, CDI has some pretty notable accomplishments. For starters, they supply a large contingent of the US government with their torque wrenches (think maintaining military ground vehicles, aircraft, and watercraft as an example). In addition, CDI has been a frontrunner in the development of electric torque wrenches, which are second to none. In addition to electric torque wrenches, CDI also manufactures a range of mechanical torque tools including dial type torque wrenches, click type torque wrenches, torque limiting screwdrivers, and a myriad of other calibration equipment and special application products. 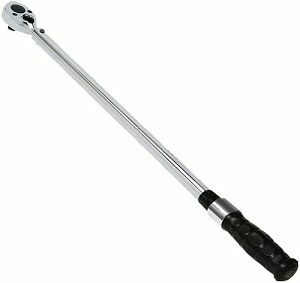 With such a reputation, it was hard to resist reviewing their budget oriented torque wrench, the CDI 1002MFRPH 3/8″ Comfort Grip Micrometer Adjustable Torque Wrench. When it comes to features, the 1002MFRPH comes with all the basics, but nothing superfluous or unnecessary. First, the dual scale is calibrated for both metric and SAE units in both forward and reverse directions. Setting the torque is easy with just a quick twist of the handle to line it up with the laser-engraved scale on the body of the wrench. The torque range is from 10-100 ft-lbs (16.9-132.2 N-m), which is ideal for wrenching on cars. Accuracy is +/- 3% in the clockwise direction and +/- 5% in the counter clockwise direction, which is sufficient for most automotive work (sparing highly precise jobs that would require torque putty anyways such as rod bearings). This wrench meets ASME B107-14-2004 and ISO 6789 standards, as well as comes with an N.I.S.T. traceable certificate of calibration, so you can be confident that nothing has been left to chance. Switching between clockwise and counterclockwise operation is a breeze with a thumb lever on the ratcheting head that is readily accessible. Overall length is 16 inches, which is compact enough to position around your engine bay without having your motion limited by other engine components. Finally, when it comes to hitting your torque setting, you are rewarded with a very satisfying and noticeable “click” that indicates that you have reached your desired value. Simply put, this wrench has fantastic build quality, which is to be expected from a company as notable as CDI. The body of the wrench is steel with outstanding fit and finish. The comfort grip handle is nice, and although it’s not metal, has a reliable and sturdy feel in hand. The ratcheting head has hardened steel where it counts and this wrench is stiff with no discernible flex upon heavy torque application. Operation of the ratcheting mechanism is smooth. CDI warranties their wrench for a year after purchase, although we wouldn’t expect that you would ever need to exercise this warranty if you take care of your tools. Overall, the wrench is very well built and CDI made no missteps when it came to materials selection or quality control. From the look and feel, CDI had hard and repeated use in mind when they designed this wrench. The wrench feels heavy and durable, just as a tool designed to last should. When it comes to value, there are few torque wrenches on the market that rival CDI’s offerings, and this is particularly true for the 1002MFRPH 3/8″ Drive. This wrench has the same quality as CDI’s higher priced metal handled wrenches, with the main difference being the metal handle. For us the handle material is a matter of personal preference, so if you aren’t picky, save a few bucks and pick up CDI’s comfort grip handle over their metal handled wrenches. When it comes to places to order from, Amazon’s aggressive pricing usually trumps local tool stores, if local mom and pops even carry CDI wrenches at all. As such, we usually nudge people in this direction if they are looking to pick up decent quality tools. If in the end you find that the CDI Comfort Grip isn’t the right torque wrench for you, feel good knowing that there are many other options out there which you can read more in depth about in our torque wrench buyer’s guide. On the other hand, if you are interested in the 1002MFRPH you can see more pictures, read more reviews, and see prices by clicking here!